Last week I wrote a post about my DIY flash diffusers. One of the challenges using the flash in macro photography of insects and other arthropods is the shiny surfaces. I often find beetles one of the tougher bug subjects of which fact I am sure I have lamented before. The round, curvy surface of tortoise or lady beetles make them hard enough to shoot in the first place, but their shiny elytra can create harsh, detracting glare spots in a photo taken with inadequate flash diffusion. Another sometimes challenging subject is the jumping spider. Unlike shiny beetles, a jumping spider does not have a lot of glare inducing areas on its body. The chelicerae, which are the mouthparts behind the palps containing the venom glands, are sometimes iridescent (see the green chelicerae of the P. audax below), but the flash usually accentuates them in a striking, attractive way in my experience. Some jumpers like the peacock jumping spiders are shiny on other body parts apparently much to the same iridescent effect (though I haven’t had the privilege of photographing them myself). The tough aspect, and very often the crucial aspect, is the eyes. They are very reflective, and a flash can cause odd, funny, distracting or off-putting reflections. One of the stranger ones you’ll see is when a ring flash is used with little or no diffusion: each eye features a bright ring of light, somewhat cartoonish, robot-like and, in my view, very distracting. My featured image shows a jumping spider hiding in a crevice (yeah I kind of chased it into a corner) of a split rail fence with its own bizarre reflection. This effect is not typical for my photos or probably anyone else’s. The sort of gradient suggests movement, as in a light trail. It took me the longest while, I admit just a bit sheepishly, to figure it out. I kept wondering how my flash head could move (and this was possibly taken during my on-camera flash days), but it was simply a result of the crevice and how it blocked the top and bottom portions of the diffuser. For the most part I like how my jumping spiders’ eyes have come out, but as I said in the previous DIY flash diffuser post, I’m looking to improve on it. Phidippus regius, the Regal Jumping Spider, shot last fall. Today is the day (I hope)! 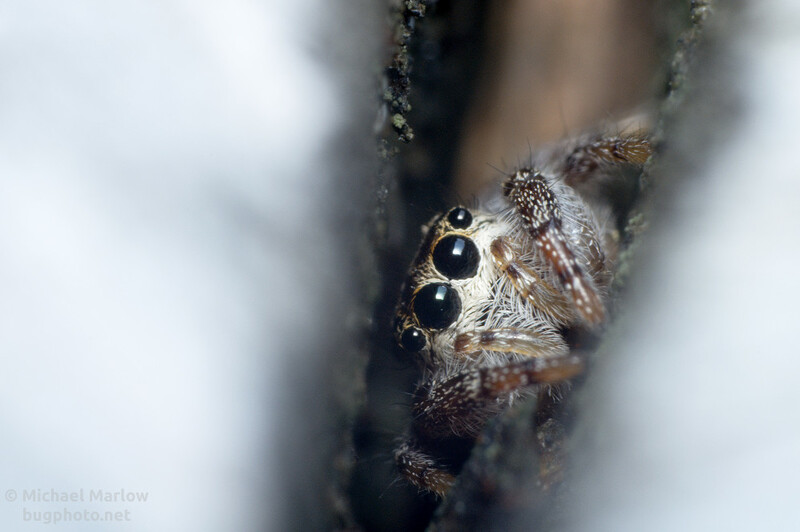 Posted in Jumping SpidersTagged DIY flash diffuser, jumping spider, macrophotography, Phidippus audax, Phidippus regius, reflection, reverse lens, Salticidae, Sitticus pubescensBookmark the permalink.